The Church was a powerful force in medieval England. 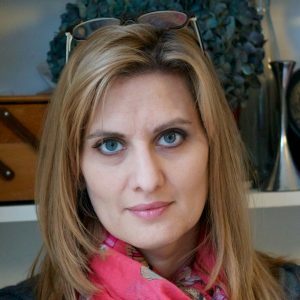 Here Dr Alixe Bovey examines how the Church was organised, why people went on pilgrimages, and what happened to dissenters. The Church was the single most dominant institution in medieval life, its influence pervading almost every aspect of people’s lives. Its religious observances gave shape to the calendar; its sacramental rituals marked important moments in an individual’s life (including baptism, confirmation, marriage, the eucharist, penance, holy orders and the last rites); and its teachings underpinned mainstream beliefs about ethics, the meaning of life and the afterlife. 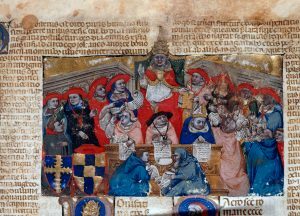 The Pope, as the head of the Catholic Church, led the single most powerful institution of the Middle Ages. He was assisted in the governance of the Church by up to 70 cardinals who would advise on matters of faith and discipline. 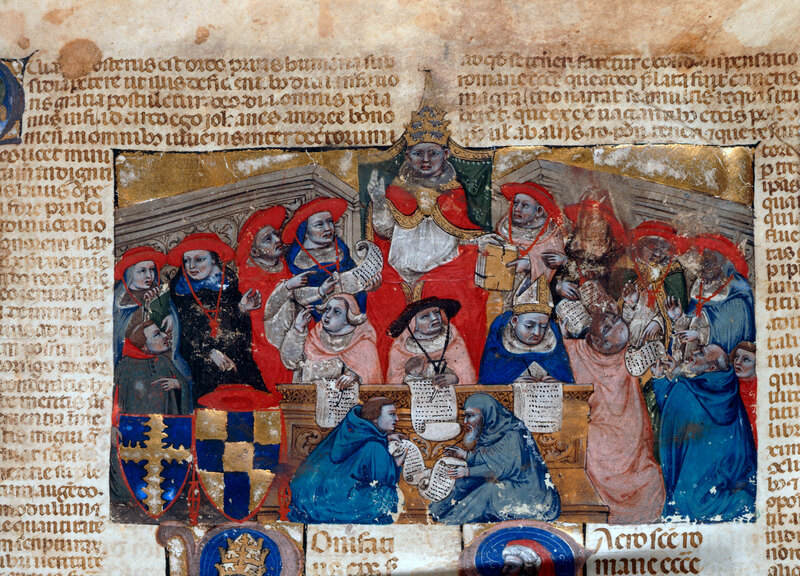 This illustration depicts Pope Boniface VIII consulting his cardinals. The headquarters of the Western Church was Rome. For most of the medieval period, this was the chief residence of the Pope, who was regarded as the successor of St Peter. Christ had appointed Peter the chief apostle, and gave him the ‘keys to the kingdom of heaven’ (Gospel of St Matthew 16:19) which, according to tradition, were inherited by his successors. The Western Church maintained the status and powers of St Peter devolved to his papal successors; however, the primacy of the Pope was rejected by the Eastern Church, which had a distinct hierarchy, theology and liturgy. 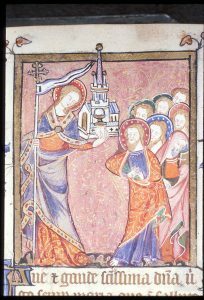 In medieval art, the Church was symbolised by a woman, Ecclesia, who was sometimes shown overpowering her blindfolded persecutor Synagoga (or Synagogue, the Jewish house of prayer). Medieval Christian belief stated that demons were fallen angels who underwent a physical transformation to become the beasts that tortured souls in Hell. 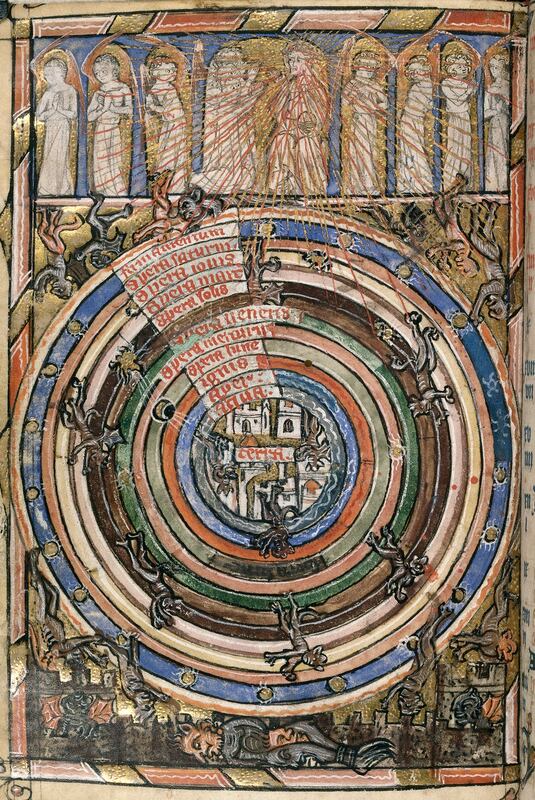 This can be seen in this miniature of the earth, taken from the manuscript known as ‘The Neville of Hornby Hours’, which like traditional books of hours, contains a collection of devotional texts: prayers, poems and psalms. Here God and his angels can be seen at the top of the image in Heaven, while the failing angels, becoming devils are seen in Hell below. , Images like these emphasised the need to live a good Christian life. 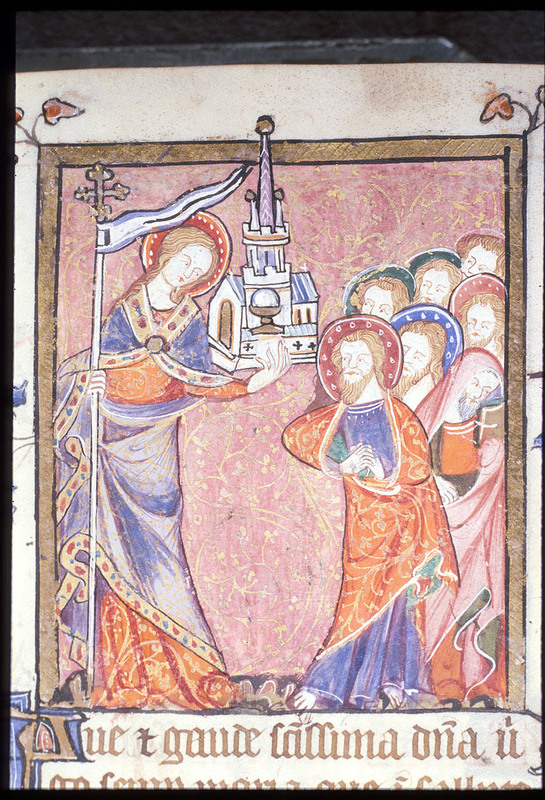 While similar to images of the Virgin, this image is more likely to be Ecclesia, a female personification of the Church. She is often depicted in manuscripts, statues and stained glass windows, holding a staff and a church building. When shown alongside images of a blindfolded Synagoga, a representation of Judaism, she is used to illustrate the supremacy and power of the Christian Church and dogma. The success of the Church as a dominant force can be attributed in no small measure to its highly developed organisation, which over the course of the Middle Ages developed a sophisticated system of governance, law and economy.The institutional Church can be divided into two unequal parts: the larger of the two was the secular church, and the other was the regular church, so called because its members followed a monastic rule (regula, in Latin). The secular church, attended by the general population, was carved into regions governed by archbishops, and their territory was in turn divided into areas known as diocese, which were administered by bishops. The parish church was the basic unit of the Christian community, providing the sacraments required by the lay community. For most medieval Christians, religious experience was focused on a parish church which they attended, at least in theory, on Sundays and religious festivals. 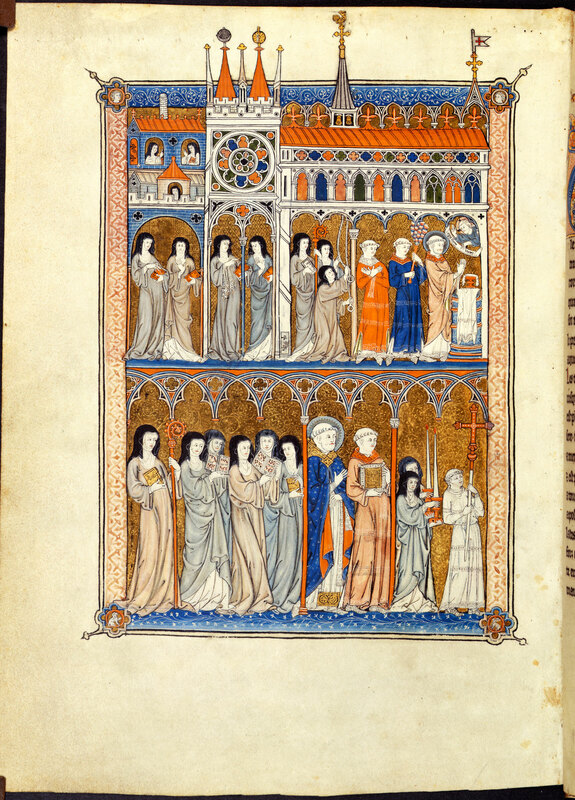 The regular church, by contrast, consisted of men and women who had sworn vows of obedience, celibacy and poverty. Most of these people lived in communities governed by a ‘rule’, a book of instructions. The most influential and widespread rule was the Rule of St Benedict (c. 620 – 30), which set out a detailed routine consisting of manual labour, prayer and study. 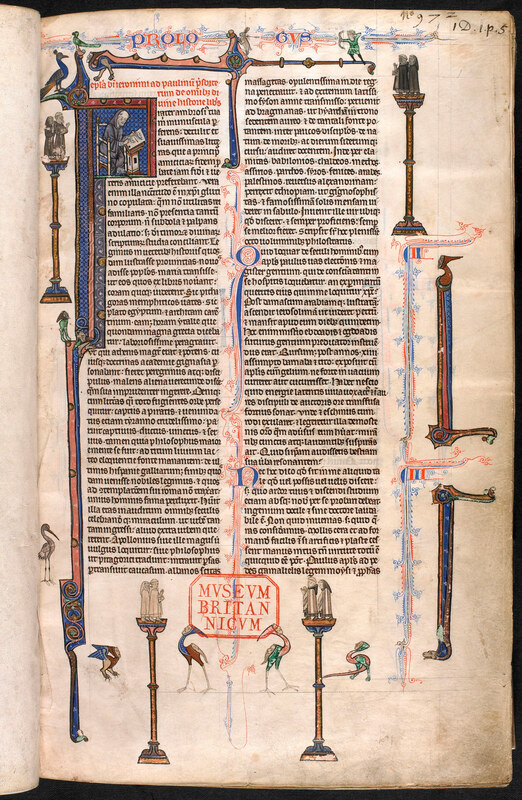 This decorative letter opens the Prologue to the Rule of St Benedict, a very influential book of instructions, which set the times of communal prayer and dietary regulations for the Benedictine Order. This is an example of spiritual guidance provided for monks about how they should live when they have chosen to dedicate their lives completely to the Church. Numerous other religious orders, some stricter and others more lenient, proliferated in the Middle Ages: these can be categorised as monastic orders, mendicant orders, and military orders. Monks and nuns tried to remove themselves as much as possible from the secular world, ideally living in communities with minimal contact with the outside world. This illustration depicts mendicant friars preaching from the top of two pillars. Mendicant means to move from place to place, and these friars would have travelled around preaching and begging for charitable donations, food and lodging. Derived from the Latin word ‘to beg’ (mendicare), the mendicants were orders who engaged with ordinary people by preaching to them and hearing confession. The military orders were made up of knights who participated in the crusades which sought to capture the Holy Land and convert Muslims to Christianity. Pilgrimages to holy places enabled the faithful to atone from their sins, seek miraculous cures and extend their experience of the world. Bodily remains of saints, and also objects associated with them (such as the Virgin’s mantle, the holiest relic at Chartres Cathedral), were the star attractions for pilgrims. Pilgrims might travel relatively short distnaces to see and touch the shrines of local saints, or undertake more ambitious (and dangerous) journeys. The most popular destinations were Rome, Santiago de Compostela in Spain, the Holy Land, and Canterbury. Geoffrey Chaucer’s Canterbury Tales, famously set on a journey from London to Thomas Becket’s shrine at Canterbury Cathedral, presents a sometimes sharply ironic view of the pilgrims and their motives. Pilgrims travelled to holy places where saints’ relics were held as they believed that by touching the relics, usually bodily remains or objects related to them, they would improve their soul and potentially receive a miracle. 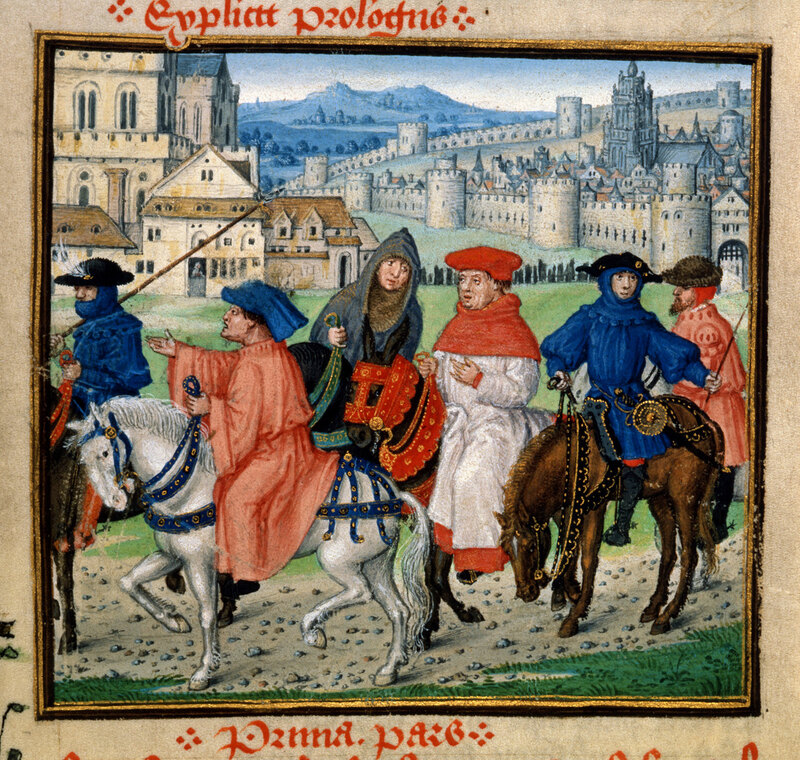 Medieval pilgrimage is most famously explored within Geoffrey Chaucer’s The Canterbury Tales, each pilgrim telling a story on their journey to Thomas Becket’s shrine at Canterbury Cathedral. The Church aggressively struggled against dissenters within and without: Christians who disagreed with the Church’s teachings were considered heretics, and could be physically punished or even killed. Those of other faiths were also treated harshly. Jews who lived within Christian territories were, at best, tolerated, though episodes of extreme anti-Semitism are numerous; even after Jews were expelled from England by Edward I in 1290, they remained a focus for popular hatred and vilification. The series of Crusades against non-Christians and heretics began in 1095, with an armed mission to the Middle East. 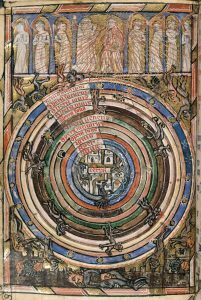 In the past, the Middle Ages was often characterised as the ‘Age of Faith’, but now it is recognised that this moniker conceals the complexity of the medieval religious culture. Christianity was the dominant religion, but not everyone followed the faith with the same intensity: judging from legislation and sermons encouraging lay people to attend church and observe its teachings, many people were lukewarm in the faith, while others were openly or covertly sceptical. Heretics were people in the Middle Ages who disagreed with the teachings of the Catholic Church or who followed other faiths, such as Judaism. Inquisitions took place to find those people who were showing signs of disbelief. Dissent was dealt with harshly with physical punishment and even death, such as being burnt at the stake as seen with this illustration. 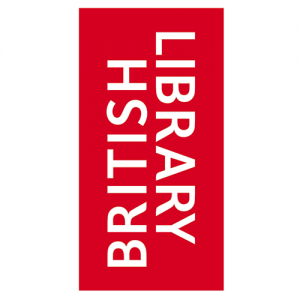 ← Who Says Libraries are Dying? They are Evolving into Spaces for Innovation!